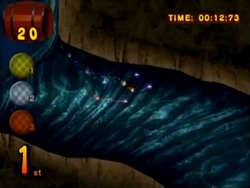 Deep Sea Sprint is the twenty-sixth level of Donkey Kong Jungle Beat and first area of the Pear Kingdom in the original GameCube version of the game. In the New Play Control! version, this level was moved to the Lychee Kingdom, switching places with Helibird Dash, making it the twenty-eighth level instead. The entire level takes place underwater, however, it is a relatively short level. Donkey Kong has to race three Sea Turtles to the finish line here. The level features a few obstacles, such as the heavy water currents, which can speed Donkey Kong up if he travels in their direction. Jellyfish also appear in this level as obstacles; however, they can only hurt Donkey Kong and never help him. After eating the giant pear at the end of the level, Donkey Kong heads to the next level, Clock Tower (Lava Cavern in the New Play Control! version). The level begins on a platform just off the shore of the water. In the shallow areas of the water, three Sea Turtles wait behind a line of bubbles rushing to the surface of the ocean. When Donkey Kong moves near the bubbles, the race begins, and the Sea Turtles race him to the finish line. On the way through the race area, there is a wide room with a few large platforms around its center. A strong current is at the bottom of this area. This room is followed by a wide pathway. On the first turn in this pathway, a current can be found to the left of the area. If Donkey Kong continues from here, he begins to head southward past many Jellyfish. The path soon curves to the west and becomes more narrow. More Jellyfish line the outside of the passage to attack the ape. After heading south again and passing some blue, underwater plants, a fork in the road can be found. While the path to the right gives the ape no bananas, the path to the north leads to a Helper Monkey, who can throw the Kong to many Banana Bunches. A pathway leading downwards is at the meeting point of the two passages, and a current can be found to the right of a large piece of land. The current can push the ape under this platform and over another to a straight pathway leading downwards. A few small passages are on the sides of this pathway, and small currents are inside of them. At the bottom of this pathway is the finish line, which appears as a thin, white line. Another current is located after the finish line to push Donkey Kong around a small turn and to a giant pear dangling on a tree branch above the water's surface. Once he bites into the fruit, the level ends. This is the only racing level in the game to have enemies in it.